If you have been to discussion forums, you may have noticed some sticky posts (usually marked by a pin) which always appear on top of other forum posts. These sticky posts are usually rules and regulations that everyone need to be aware of before posting on a forum or a post which is very popular and drive serious traffic. Sticky posts can also be implemented in WordPress. This article will discuss how to make a WordPress sticky post so the blog post always appear on the front page and on top of all other posts. By default, WordPress displays blog posts in reverse chronological order, meaning the latest posts will always appear first. However, if you recently published a blog post on a popular topic and it’s bringing you tons of traffic to the blog, it is wise to keep it as a sticky post for a few days so that it is the center of attention on your blog. Sticky posts usually bring traffic to your home page instead of a specific blog post as it usually contains the first block of text that works as a description for your site. Thus, you can carefully implement the target keywords you want in the sticky post title and excerpt to drive traffic to your home page. Sticky posts can also be used as an introduction to your blog. Since this post will always appear on top, your readers will quickly understand what your site is about. It can also be a post to market a product you maybe selling. Since, this is the first post your visitors will see when they reach your home page, it is likely to attract more attention than other posts. 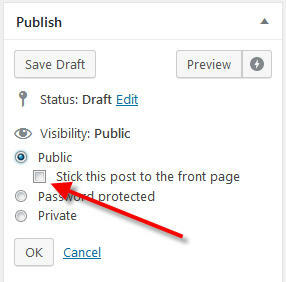 If you are writing a brand new post, simply check the Sticky post option under Visibility before you publish the post. It will make the post sticky. Depending on your WordPress theme, the sticky post maybe highlighted or styled in a different way from the regular posts. It is a good idea to only keep one or two posts as sticky posts. Do not make all your posts sticky. To remove a sticky post from your blog, simply uncheck the sticky post checkbox from the visibility option, click OK and then click the Update button to put the post back into its chronological order. There are several plugins for customizing sticky posts. These plugins allow you to add category related sticky posts and even expire the sticky posts after a specific time period. Before you install these plugins, ensure the plugin in compatible with your version of WordPress to prevent any issues. If you are not seeing sticky posts in your blog, it may be due to your WordPress theme not supporting sticky posts.